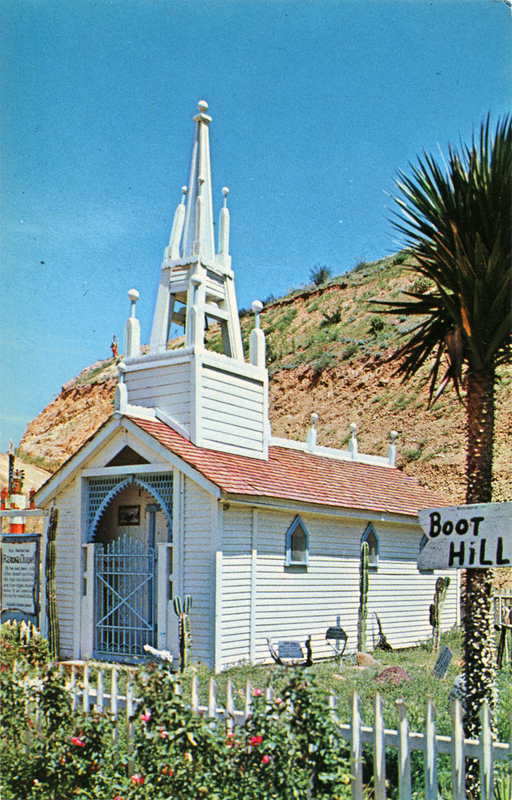 1960s postcard of the Ramona Chapel at Callahan's Old West Trading Post. Ramona Chapel — Contains eight 2-seat pews — 48 solid brass candelabras donated by Carrie Jacobs Bond, composer of "I Love You Truly," "End of a Perfect Day," etc. — with ancient alter — musical playback. Replica of Boot Hill, Tombstone, Arizona, adjoins chapel. Robt. E. Callahan, famous author, spent years collecting and assembly the articles in the chapel. H3590 Columbia Wholesale Supply, 11401 Chandler, North Hollywood, Calif. | Published & Distributed by Columbia. We don't know where he got it, but author and Western buff Robert E. Callahan (b. Oct. 27. 1892) acquired this little chapel and displayed it at his 1926 Ramona Village in Los Angeles. He named this structure the Ramona Chapel in keeping with the theme. When the Santa Monica Freeway was about to cut through his property in the early 1960s he move the chapel and some of the other buildings he'd collected to Mint Canyon along Sierra Highway north of Davenport Road, where he erected an Old West Trading Post as a tourist trap. After Callahan's death on January 10, 1981, his wideo Marion donated the chapel and other items to the Santa Clarita Valley Historical Society. Today the chapel can be visited in Heritage Junction in Hart Park. LW2531: 9600 dpi jpeg from original postcard purchased 2013 by Leon Worden.